Everyone wants to work from home but how can you do it successfully? Working from home is supposed to be better than working outside the home. Mainly, because you don't have to leave home and you can set your own hours. Not having to fight traffic every morning and worrying about being late. These are great benefits right there. Just because you are working from home doesn't mean that you are not working. Don't get it confused. I know that since you are working from home and no one is seeing you that it doesn't really matter what you are wearing. However, I think it is better to still get dressed. You can still be comfortable but put some clothes on and don't stay in your pajamas. The reason being is you want to be productive and sometimes when you are in your pajamas you tend to get lazy. It sets the tone that you are getting ready for bed. Which in fact, that is the opposite of what you are doing. So get up shower and get dressed. Do everything that you would do if you are going out to work. The only difference is you now have more time to do it. Have a good breakfast. After that start your day. You can have a designated place to do your work. Such as a home office. If you have children or have company then this would be ideal. However, if you live alone or your children or in school it's nothing wrong with doing your work outside your home office. It can be relaxing to have a change of scenery. Having an adjustable, portable laptop table is great for your work days that you do your work outside of your home office. It's also a great idea to let people know your work times. Especially, your friends and family. Many people feel that just because you work from home means you have a lot of free time and they assume that you aren't really working (which is so far from the truth). This will help you stay more focused and get more work done and have less interruptions. Be nice but firm. Not answering the phone or texting during your work times (unless it is extremely important) is a good idea. Having a schedule is really great for working from home. Set your own hours. Whether it is early in the morning (I think this is the best time to work) afternoon, or evening. Whichever, is best for you. Stay consistent with your schedule. It can be tempting to veer off but stay steadfast. You will see improvement in your work and you will get things done. This is why many people don't work from home successfully, because they believe working from home means not working. You are working. You are just working from home. Many people can't separate the two. Don't be one of these people. Take a lunch break. Eat lunch. Take a little walk or stretch your legs. As I said before the benefit of working from home is you don't have to rush. So, take your time. Working from home is fun. Who wouldn't want to work from home? If done correctly it can be a benefit for you and your family. Do you work from home? Or are you considering it? Let me know in the comments below. I hope these tips will benefit you and help you work from home successfully. As bloggers/internet marketers we have a lot of work to do. The work that we do is definitely not for the faint-hearted as many find out all too soon. We have to constantly come up with content to write, networking, promoting and staying updated. We have to do these things consistently and on a daily basis. That's not counting other things that we have to do in our lives. It can be a hectic lifestyle indeed. We spend a whole lot of time on our computers. Our minds are continually racing about what can we do or if we did everything that we should of done. The feeling of did I do enough is constantly on our minds. It can cause us to become slaves to our computers. We tell ourselves. I'm just going to do this it's only going to take a minute. Then, we start thinking I got to do this and before we know it we have literally spent all day working online. The truth is there is only so many hours in a day. You can't be online all day even though we spend a big portion of our lives online. It's our business and we have to run it. It's true, but at what cost? What can we do to stop this feeling from ruining our lives because that is exactly what it is doing. We work from home. So, there is know one telling us what we can or can't do. So, if we want to work all day and all night there is no one to stop us. How can we combat these feelings that we are not doing enough? First, we have to realize that we are doing enough. Sometimes you might not get everything done that you planned to do that day and that is okay. You can't beat yourself up about it. We all are entitled to have a off-day. Think about all the days that you have done everything that you set out to do. Having one off-day is not going to hurt you. You are not perfect. So, everything that you do will not be perfect. Do it the best you can and leave it at that. I will tell you a story. I am not a night person. I do not work well at night. I immediately go into chill mode at night. I am a morning person. Because I had these constant feelings of me not doing enough I started trying to get on the night shift. I would be sitting at my computer and I couldn't hardly keep my eyes open. I would be literally falling asleep. I would be telling myself that I have to get this done. I wasn't doing a good job at all. But because I had these feelings that I wasn't doing enough I kept pushing myself. I really wasn't getting hardly anything done as I couldn't hardly keep my eyes open. 1.Write down everything that you are going to do for that day. Make a list. I like to use the composition notebooks. Check off everything. Once you do that. Do not add anything by doing something else. 2.Pick what time you work better at. For me, night is not good as I told you before but if you work better at night then go for it. You have to do what's best for you. 3.Turn the computer off! That's right! Walk away from that computer! I know it calls to you but shut it down! Do you feel on a regular basis that you aren't doing enough? Does it cause you to work all day long and not get anything else you want to do done? Tell me your story. The question that is always asked is,"Can I make money taking surveys?" The answer is, "Yes, you can make money taking surveys". 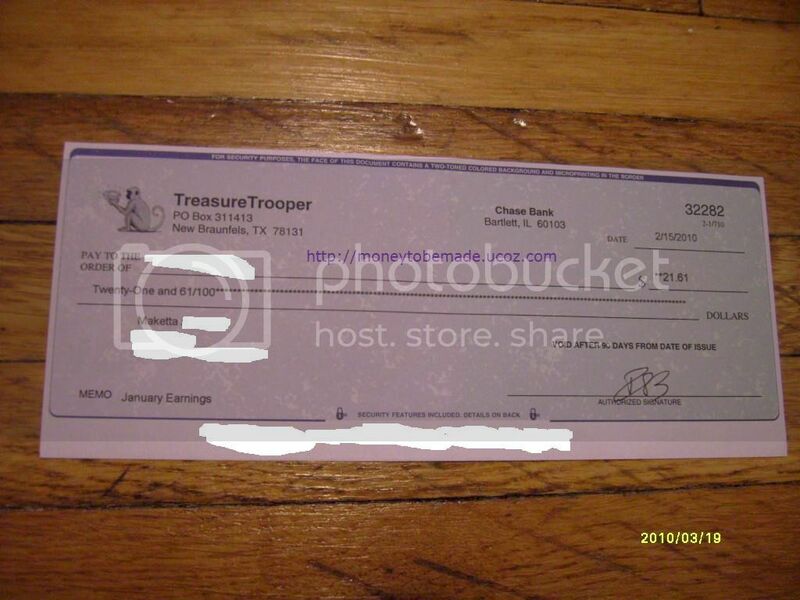 Taking surveys is a great way to make money online. Especially, if you aren't making any money at all. 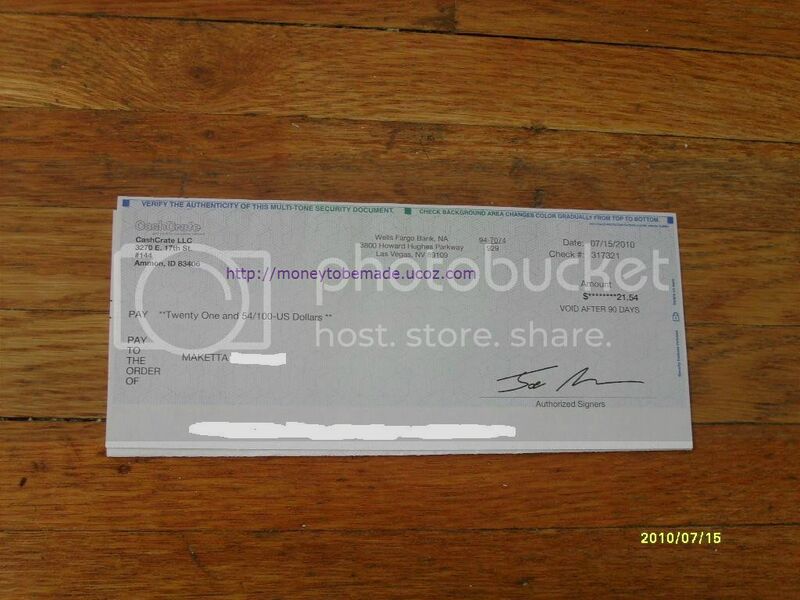 The picture above is a check that I received last month from Cashcrate. The reason that I posted it is to show proof that they do pay. I have made quite a bit of money with Cashcrate. It is one of my favorite survey companies to take surveys with. Another question that is asked, "How much do they pay?" They pay according to how many surveys that you take. With some survey companies you get points and you can exchange your points for cash. With others you complete offers , watch videos and referrals. Some people say that surveys can be time consuming. They can be a little. However, if you are looking for a way to make money and you haven't been making any money at all. I think they are worth the time. Surveys are also fun. I love giving my opinion. I am very health conscious and now I am even more so because I have fibroids which I am trying to shrink. So, I am on a strict diet. I took a survey and one of the questions I was asked was, "What do I think about the food here in America?" I was able to give my honest opinion. Which was I didn't think it was too good. That's why I enjoy taking surveys. I get to tell my opinion as a consumer. Also, the money I made from surveys has helped me out a lot. I have been able to purchase some health products I needed for my condition. Another problem people say they have with surveys is they flood your email with a bunch of emails. Some survey companies do send surveys to your emails. Also, sometimes they require an email address when you fill out survey forms. What I do is I make an email with Viralinbox. They allow you to make more than one email box. I have an email box I use just for surveys. If you would like to read more information about them. You can do so, in a previous blog post I wrote called, "Keep Your Email Organized And Spam Out Forever". So, if you know someone from the above list. Share this blog post with them. You will be doing them a great favor. There are many survey companies to choose from. I would advise you to choose from several companies. I wrote a blog post about some of the ones that I really enjoy taking surveys from. In this blog post called,"Cash Paying Online Surveys". The bottom line is you can make money taking surveys and it won't interfere with what you are already doing. It's fun easy and free. It won't get any better than that. Do you have video games, dvds, or cds that are in mint condition and you are not using them anymore? Wouldn't you like to get paid for them? You can take that money you make from selling them and buy you some new ones. That would really be nice wouldn't it. Everyone could use some extra cash these days and I know you are not any exception? Plus, it's a better alternative then just throwing them away. We don't need anymore things just rottening away in our landfills. Now, do we? This is a perfect way to dispose of them. I know many times we have old video games, dvds, and cds that we have watched and played a million times but they are still in good condition. Year after year they just sit around taking up space and you get tired of dusting them off everytime you cleanup. Now, you can send them in and make some extra cash. Plus, shipping is free. 1. Get an instant price quote. 2. Print out free shipping label. 3. Get paid via check or Paypal. That's it! Just three simple steps and you are on your way to making some extra cash. Remember, the discs must be in good condition. Just ask yourself,"Would I want to receive something like this?" If not, then you shouldn't send it in. The only thing left for you to do now is to start selling your dvds, cds, and video games Click Here! Also, if you would like to sell your used books Click Here! Do you want to make some easy cash? How about taking surveys? It's a great way to make some extra money and it doesn't interfere with what you may already be doing such as: working a job, internet marketing, or building your business. In fact, the money you make will come in handy. Use this money to pay bills, treat yourself or save it for a rainy day. Remember, this is something you can do in your spare time so, you don't have to stress yourself out about it. Set a time of day to login to complete your offers and take surveys. Consistency is key. I know I don't have to tell you what to do with extra money. It's nice to have more than one income coming in these days and cash paying online surveys are a great way to help you do that. It's easy money and you aren't going to get it no easier than this. I know you want to know do you really get paid from taking surveys. Yes, you do. I will be sharing some pictures of the checks that were sent to me. So, you will be getting proof. I'm going to start with my favorite online survey site which is Cashcrate. Ipsos is a nice survey site where you earn reward points which you can redeem for gift cards, e-certificates, charity donations, and you can earn cash. Here are a couple more survey sites that I encourage you to check out than join they are SquishyCash , Toluna,andFusioncash. Are You Ready To Make Money Selling Your Used Books Online? Do you have books that you are not reading anymore and they are just sitting around collecting dust? Couldn't you use the extra room on your bookshelf for books that you haven't bought yet, but you will buy soon? You probably have thought about recycling them, but why do that when they are still in mint condition and you can sell them and make some extra cash. You could also use the extra room in your house too. Especially, those textbooks that you know you will never use again. This is a great opportunity to sell them and make some extra money. This is especially for you if you have boxes and boxes of books that you have probably forgotten about in the basement. 1. Enter your book isbn number. 2. Print a shipping label. Three very easy ways to sell your books. Shipping is also free. So you sell your books which is no cost to you. You might ask friends or family members if they have books that they don't want anymore. If they do ask them to give them to you. You can sell them and make some extra money. This is fast easy and free. So, where can you sell your books at to start making money? Are You Looking To Post A Job Or Find Freelance Work? Are you looking for a freelance job? Do you have a job that you would like for someone to do for a price? Many people who do these kinds of jobs are called freelancers. So, what exactly is a freelancer? A freelancer is someone who works as a writer, designer, performer, or the like, selling their services by the hour, day, job, etc., rather than working on a regular salary for an employer. Many jobs consist of the person working from home or online. The person or company who is offering the job usually lets you know if you can do the job from any location. If you are looking for freelance work or would like to post a project. You may do so on the Money To Be Made Project Board. If you have skills in writing, translation, web design and seo you may find projects that you will be interested in. It's very easy to post a project or find a project that you would like to do. You can also do a search if you are looking for a particular project. So, if you are looking for freelance work this is the place for you. Please also check out the widget on the sidebar too. Finding freelance work has just got a whole lot easier.